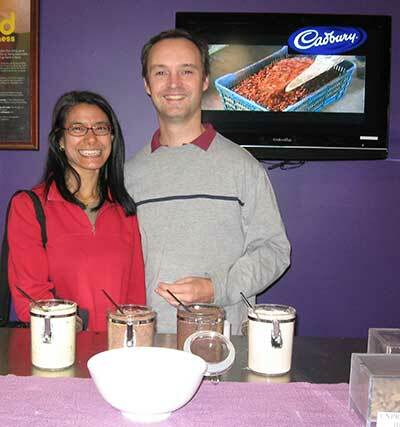 Hobart's Cadbury chocolate factory welcomes visitors. I had never been to a chocolate factory before. I'm sure that at some point, I had been told how chocolate was made. But I could not remember anything about it. 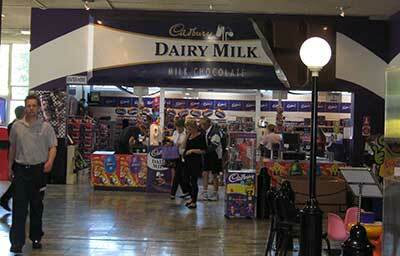 So it just made sense that I should pay a visit to the Cadbury chocolate factory in Hobart. On arrival, I was struck by the size of the fairly large carpark. Was this to accommodate employees plus all the visitors that came through everyday? On entering the building we paid for admission and were presented with admissions slips and... chocolates! We were told that the factory's manufacturing areas were off limits. 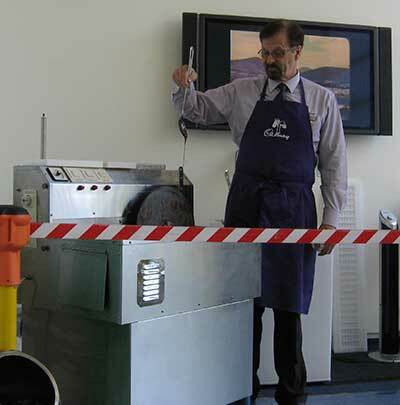 However there would still be plenty of opportunities to learn about Cadbury chocolate in the visitor areas. In the next room, there was a little souvenir shop and some interesting Cadbury exhibits. Being good window shoppers we enjoyed having a browse among the souvenirs. We did actually pick up a fridge magnet as well. 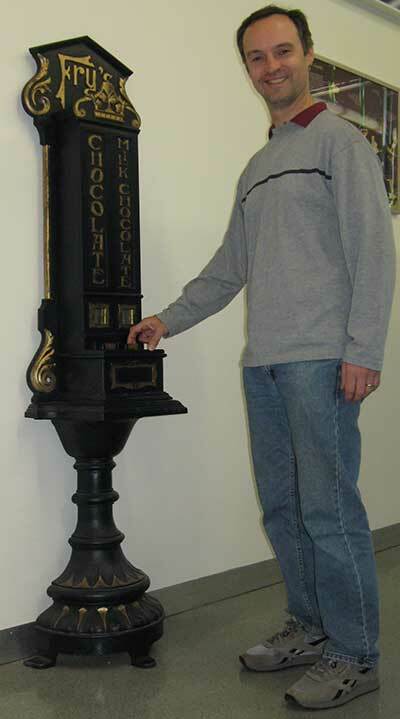 We found this lovely old chocolate vending machine. In another room, a film about Cadbury was being screened. It ran every 15 minutes. It was nice to sit down and listen to the Cadbury story. How the chocolate factory came to be built in Hobart is pretty interesting. 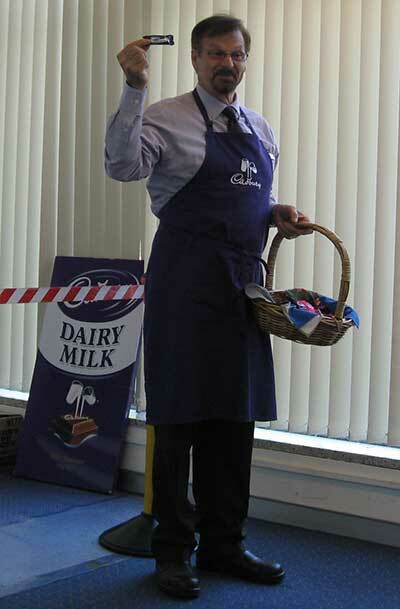 We also watched someone tell us about the history of Cadbury chocolate, in person. The presentation went for about half an hour. This proved to be a great opportunity to ask questions. Did you know that white chocolate does not really have chocolate in it? I didn't! It used to be my favourite. But not any more!!! After the talk, we went on to the Discovery Station to do some chocolate tastings. We were offered a little cocoa mass to taste. What is cocoa mass? That's how chocolate starts out. It's just about as pure as it gets. Having been advised that we might find it a little bitter, we were cautious when tasting. To my surprise, I actually quite liked it! But let me warn you, it tastes quite different from the end product. Thousands of heroic survivors of enemy action at sea have owed their lives to the rations which form part of every lifeboat's regulation equipment. Chocolate is always included. Large quantities of Cadbury's Energy Chocolate have been supplied to our Merchant Navy for this purpose. Thus the war gives us further dramatic proof of the wonderful sustaining properties of chocolate. Such vitally important uses for chocolate naturally absorb a large portion of Cadbury's output, and make civilian supplies uncertain. Still, occasionally, you will find yourself in luck, and see a welcome block or two of Cadbury's Energy Chocolate or Dairy Milk Chocolate in your confectioner's. In New South Wales and South Australia, we are unable to distribute Cadbury's Chocolate owing to transport regulations. Well, we are certainly lucky these days aren't we? We came across another poster announcing that Fairtrade Certified chocolate was arriving at Easter in 2010. "Benefitting 40,000 farmers" the poster stated. That's certainly terrific news for the farmers. The last place we went to was the chocolate shop itself. We expected that we would be spending a lot of time there so we saved it for last. What can you expect at the shop? Lots of chocolate, lots of variety, and yes there are bargains to be had. Finally we walked out of the Cadbury chocolate factory visitor centre. By then, we had quite a chocolate collection I can tell you!